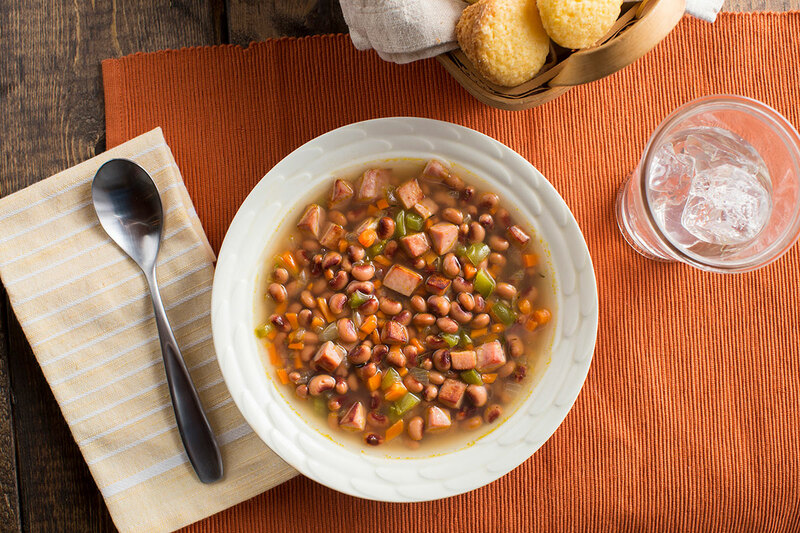 This classic Southern side dish easily becomes a hearty soup with the addition of broth. Serve with cornbread and pass the hot sauce! Heat oil over medium-high heat in a large saucepan or Dutch oven. Add ham and brown well, stirring occasionally. Add onion, carrots and bell pepper; cook 5 to 7 minutes, stirring frequently, until vegetables are soft and beginning to brown. Stir in broth, black eyed peas, rice, if desired, garlic and thyme. Bring to a boil, reduce heat and simmer 10 minutes. Season to taste with hot sauce. Side Dish Black Eyed Peas & Ham – In Step 2, omit broth and rice. Stir in black eyed peas, garlic and thyme and cook 3 to 5 minutes over medium heat, stirring constantly. Season to taste with hot sauce.